Lou Gehrig was the finest first baseman ever to play major league baseball. A left-handed power hitter who grew up in New York City, Gehrig played for the New York Yankees from 1923 to 1939. Throughout his career, he lived in the shadow of his teammates Babe Ruth and Joe Di Maggio, but Gehrig was a great hitter in his own right: he compiled a lifetime batting average of .340 and drove in more than 100 runs every season for 13 years. During his career, he batted in 1991 runs and hit a total of 23 grand slams (home runs with bases loaded). But Gehrig's greatest baseball record, which stood for more than 50 years and has been broken only once — by Cal Ripkin, Jr., in 1995 — is his record of playing 2130 consecutive games. In the 1938 baseball season, Gehrig fell into a strange slump. For the first time since his rookie year, his batting average dropped below .300 and, in the World Series that year, he managed only four hits—all singles. Nevertheless, he finished the season convinced that he was undergoing a temporary slump that he would overcome in the next season. He returned to training camp in 1939 with high spirits. When the season began, however, it was clear to everyone that something was terribly wrong. Gehrig had no power in his swing; he was awkward and clumsy at first base. His condition worsened and, on May 2, he voluntarily removed himself from the lineup. The Yankees sent Gehrig to the Mayo Clinic for diagnosis and, on June 20, his medical report was made public: Lou Gehrig was suffering from a rare, progressive disease known as amy-otrophic lateral sclerosis (ALS). Within two years, he was dead. Since then, ALS has commonly been known as Lou Gehrig disease. I 6.1 Some cases of amyotrophic lateral sclerosis are inherited and result from mutations in the gene that encodes the enzyme superoxide dismu-tase 1. 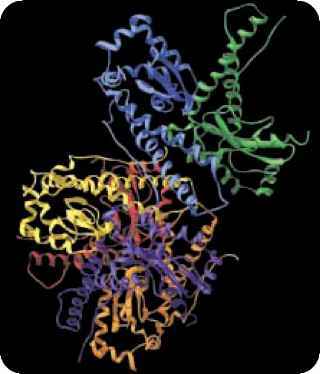 A molecular model of the enzyme. degeneration of the motor neurons. Most cases of ALS are sporadic, appearing in people with no family history of the disease. However, about 10% of cases run in families, and in these cases the disease is inherited as an autosomal dominant trait. In 1993, geneticists discovered that some familial cases of ALS are caused by a defect in a gene that encodes an enzyme called superoxide dismutase 1 (SOD1). This enzyme helps the cell to break down superoxide free radicals, which are highly reactive and extremely toxic. In families studied by the researchers, people with ALS had a defective allele for SOD1 ( FIGURE 6.1) that produced an altered form of the enzyme. How the altered enzyme causes the symptoms of the disease has not been firmly established. Amyotrophic lateral sclerosis is just one of a large number of human diseases that are currently the focus of intensive genetic research. This chapter will discuss human genetic characteristics and some of the techniques used to study human inheritance. A number of human characteristics have already been mentioned in discussions of general hereditary principles (Chapters 3 through 5), so by now you know that they follow the same rules of inheritance as those of characteristics in other organisms. So why do we have a separate chapter on human heredity? The answer is that the study of human inheritance requires special tech-niques—primarily because human biology and culture impose certain constraints on the geneticist. In this chapter, we'll consider these constraints and examine three important techniques that human geneticists use to overcome them: pedigrees, twin studies, and adoption studies. At the end of the chapter, we will see how the information garnered with these techniques can be used in genetic counseling and prenatal diagnosis. Keep in mind as you go through this chapter that many important characteristics are influenced by both genes and environment, and separating these factors is always difficult in humans. Studies of twins and adopted persons are designed to distinguish the effects of genes and environment, but such studies are based on assumptions that may be difficult to meet for some human characteristics, particularly behavioral ones. Therefore, it's always prudent to interpret the results of such studies with caution.